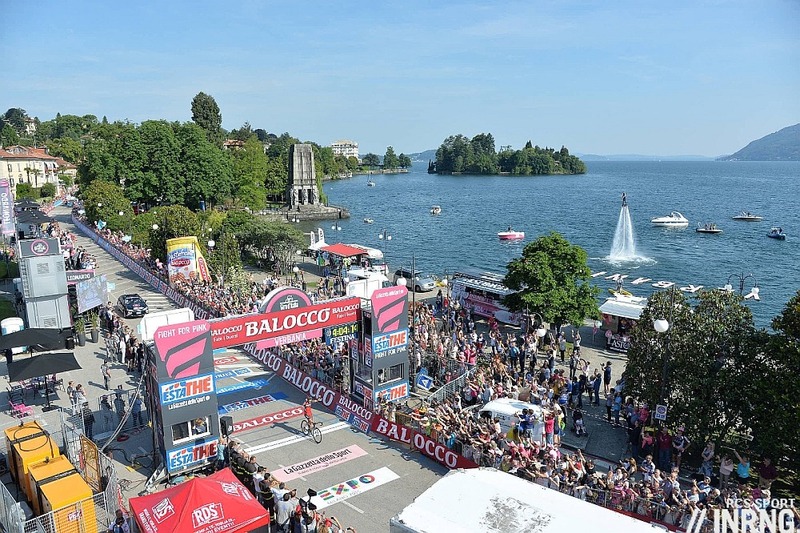 The Queen stage of the Giro. 236km, three big climbs and almost 5,000m of vertical gain. It’s enough to turn many of the peloton into ardent anti-monarchists. Stage 18 Wrap: a win for Philippe Gilbert. On a day that resembled a mini Giro di Lombardia the best Lombardia rider in the peloton took his chances, helped in large part by his BMC Racing team mate Amael Moinard. Gilbert wasn’t climbing with the best up Monte Ologno but made his way back to the leaders over the top of the climb and attacked them on the spot with that fearsome acceleration. Hesitate for two seconds and he’s gone. Gilbert crossed the line without sunglasses, they have their uses but it was refreshing to see his delight with the win written all over his face. Mikel Landa had a mechanical and Contador decided to profit, not so much payback but an Tinkoff credit cashback delivered to Astana and their decision to profit from Contador’s mechanical the other day. Contador was joined by Ryder Hesjedal, no mean feat for the Canadian. In full flight Hesjedal resembles a wounded giraffe trying to gallop. But it’s effective and if he can keep it up he’ll move further up the GC. The Route: a 150km warm-up before the mountains. That took you one or two seconds to read, it’ll take three and a half hours of racing. The first climb goes up to Saint Barthélemy, it’s not a mountain pass just a narrow road that rises up the side of the Aosta valley to reach the village above. It has impressive views but the breathtaking part is the start where the steep gradients kick on, it’s 16.5km at 6.7% but with 10% for the first two kilometres and some flat and even downhill sections. Then it’s straight back down to the valley again on a narrow and at times rough road. There’s almost no rest before the Col St. Pantaléon starts, 16.2km at 7.2% average but flattered by flat sections making this another strength-sapping and energy consuming climb on a good sized road as it climbs up from Chambave past the vineyards with a series of hairpin bends to cross to the Valtourenche valley with a good descent. The Finish: an irregular profile above but this is a big main road and an accessible ski resort. The last time the Giro came here Andrey Amador won the stage and Ryder Hesjedal attacked the GC contenders, the race winning move. The climb starts to level out gently 3 km before the finish and then rises up for the final 450-m long home straight. The Contenders: a breakaway or another GC fight? Normally the former but this Giro isn’t normal. The climbs today are tough in their length, gradient and repetition but they’re the long grinding Alpine sort rather than sharp ramps to launch attacks. Plus the distance could encourage riders to huddle. UCI points go down to 20th place so if, say, the likes of Giovanni Visconti, 14th overall and 21 minutes down, decide to attack they could find others chasing them just to defend a point or two. Albert Contador is the default pick, he’s now taking pleasure in crushing Astana’s two captains. I think he wants tomorrow’s stage more than today but he’s hardly in the mood to dole out the gifts unlike a week ago at Madonna di Campiglio but we could see Mikel Landa out for revenge; Astana have faded now but L-L Sanchez could be worth watching if he’s allowed to attack on a descent, the same for Vasil Kiryienka if Sky let him ride for the stage win instead of helping Leopold König, he won the penultimate stage of the 2011 Giro, a 242km day out. This could finally be Steven Kruijswijk’s day as he’s got a decent sprint on him and is showing no signs of fatigue but his problem, if we can call it one, is that he’s eighth overall so he’s not going to get much room to attack, he’ll have to win the sprint. Ryder Hesjedal matched Alberto Contador yesterday and enjoyed his last visit to Cervinia. Carlos Betancur and Beñat Inxausti need a mountain raid to get blue jersey of Kruijswijk’s coathanger-shoulders. Finally some wildcard names with Ilnur Zakarin, Esteban Chaves and Stefano Pirazzi. Weather: sunny and warm in the valleys with 24°C but cooler at the top of the climbs. TV: the feed starts at 3.00pm CET with and the finish is forecast for 5.15pm Euro time. Cyclingfans and steephill.tv serve up pirate bounty if you can’t find it on TV. The Giro is: almost in France. Just as parts of the Italy’s north-eastern Alps have German and Ladin speakers, the Aosta valley to the north-west was French until 1860 which explains names like Saint Barthélemy rather than San Bartolomeo. There’s no river called Aosta, instead the valley is named after the town of Aosta and the river is the Dora Baltea. If the area has been Italian for 150 years in 1871 Maurice Garin was born but poverty meant he and his family quit the Italian Alps for France and Garin became French. In 1903 he won the first ever Tour de France. There’s a road in Aosta named after Garin. The valley is also host to the U23 Giro della Valle d’Aosta, one of the hilliest amateur stages and won twice recently by Fabio Aru, other recent winners include Davide Vilella of Cannondale-Garmin and FDJ’s Thibaut Pinot who won the race in his first year out of the junior ranks. Thanks Inrng. Contador ‘s to lose today but if König and Kiri can work together I can see a win for König. Fingers crossed for Kruijswijk or Hesjedal as they’ve both put in some great efforts so far and it would be nice to see one of them rewarded with a stage win. What happened to Pirazzi? He used to be a very visible rider. Is he lacking form this year? Or something else? Very interesting and well written. Thank you. I enjoyed the Hesjedal giraffe comparison, neither he nor Froome are going to be used by future coaches as models of an ideal riding style, but they get results. ironic that he’s coached this year by David Millar, one of the “formiest” riders of recent years. Agreed, although I don’t think any giraffe would appreciate the comparison (wounded or not). It’s not like Liquigas or Astana have invented this tactic! Maybe if Aru wouldn’t have been ill, it would have worked out. Against Alberto Contador you got to come up with a serious game plan, this one was as good as any other if you look at the GC. Compared to Froome, “Le Terantula,” Hesjedal is a super model of form. Kudos to Philippe Gilbert! A classy/classic winning move and so nice to see the smiling face of a “fuoriclasse campione del mondo”. Rai sport’s processo alla tappa featured Gilbert, Chavanel,Nocentini and Bongiorno all smiles and jokes. Gilbert even offered to buy them beers. Great to see Gilbert enjoying it, sometimes when he wins it’s a relief and a satisfaction. Because so much is expected of him winning is just getting the job done but he really seemed to take pleasure out of yesterday’s win. He did a bit in Belgian rouleur-alike magazine Bahamontes retelling his WK win in a 100m by 100m analysis of the last 3 km. It;s amazing how much thought, preparation and calculation went into a very short sprint uphill! I am also very happy to see Gilbert in winning mood again. The crash in the Flèche should have been very disapointing for him, since I think he was in great shape this year (Looked leaner, very active in first races of the season, …) and potentially able to contest Valverde’s hegemony in the ardennaises. Apparently he is riding the Tour as well. Not sure it is the best if he wants to be good at the end of the year for the Worlds and Lombardia, but I think he targetted the Huy stage. Also delighted for Phil. Excellent highlights for a race with not a lot of sporting interest in the GC. Gilbert’s crazy-good Classics season was 4 years ago now, FWIW. Contador must have been really pi**ed off at Landa to make such a dirty and risky move. Perhaps Oleg had ideas of revenge, who knows. Hesjedal is like a stubborn mule who needs a good amount of kicking in the a** before it gets going. I’m keeping fingers cross for him and Kruijswijk today. Contador’s move wasn’t dirty – it was payback for Astana’s earlier tactics. I doubt anyone in the race, Astana included, would argue against his move. It works in just the reverse way too. If Astana had done Contador a favour, in different circumstances of course, then the favour would be returned. Nothing “dirty” about it at all, thats professional racing. I am convinced Kontador was a bit upset with Astana / Landa ‘s attitude in the Aprica stage. They first rode hard when he punctured, then in the break with Kruiswijk, Landa just sat on until his late attack. Exactly. If there is anyone at the front who understands and appreciates the nuances of professional etiquette, it’s Contador. He’s a true patron in a very subtle and thoughtful way. It really enjoy his style compared to the selfish bully that LA was. 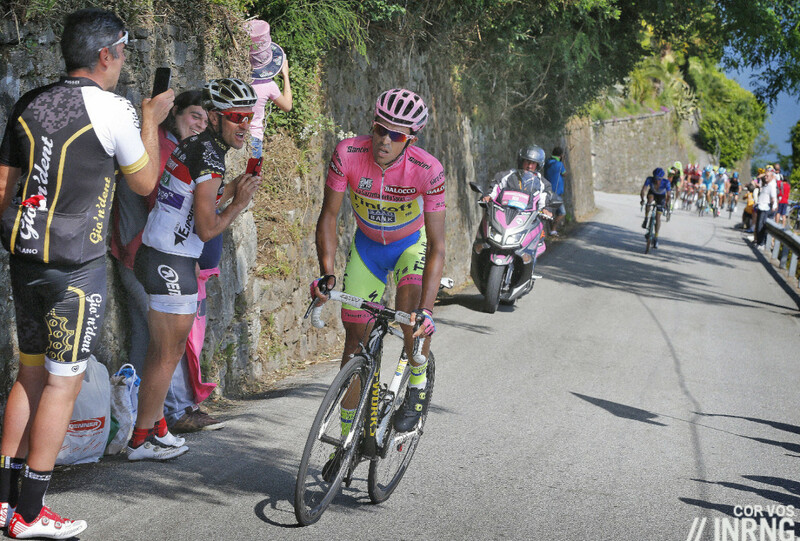 Contador has a lot of class. If Hesjedal would just learn not to ride at the back, he’d have lost a lot less time on stage 4 and would be considerably higher than he now is. He’s riding brilliantly in the third week, but at his age he should have better tactics. For a grand tour winner and GC rider his positioning is terrible. If he hadn’t been at the back and dropped on stage 4 he’d be in 5th position right now. He could use a better team as well. Garmin feels more pro conti a lot of the time and I can only imagine what it must be like to work for a guy in a vibrating three piece suit while you’re watching Riis, LeFevre and even Brailsford, etc. It might be a bit disheartening. Contador is an aggressive animal, makes for great racing and always keeps his rivals awake, agree with the comments that you have to bring your AAA game to the table to beat him. It’s also nice to see him cracking, he rode the Mortirol flat out, then had nothing in the tank for the rest of the stage, and similarly today, wounded giraffe as he will forever be known pulled him back and then with the help of a teammate held the gap. Expect more of the same today, big attack by Bertie, small time gap and then someone pulls him back. We should savour him though.. More attacks in one race from him, than we see throughout most if the year from other GC riders. Nice to see Gilbert without glasses as well, it’s all in the eyes! There will always be some controversy about Kontador’s carreer due to the steak from Irun episode, but it must be admitted that we could enjoy some very good cycling thanks to him, both in his victories as in his defeats (for instance, in the Tour won by Evans or in the Paris-Nice he lost to LL Sanchez if I remember well). Yesterday’s move was really unuseful and almost a nonsense, mostly when you remember what’s awaiting in the coming 2 days. But he did it anyway. I think the Italians say “pan per focaccia”. He waited for Ryder. I think he’s got more in the tank. Unrelated, but how is it that Boonen won in Belgium yesterday, but according to UCI rules should not even be allowed to race until the Giro is finished? Rule 2.6.026, you’re half right but the rule also says you may start elsewhere if the race organiser of the event you’ve left says it’s ok. RCS said yes to Tom Boonen just as Unipublic said yes to Mark Cavendish when he left the Vuelta a few years ago to ride the Tour of Britain. It’s hard for races to say no to the big stars but would they say yes to a less celebrated rider? He had to ask ASO for a permission to enter another race. Did Cunego’s accident involve a motorbike? One was very much getting in the way of Paolini in the previous stage. Chad Haga said it was a pothole on his Velonews blog. In particular it was the motorbike with the guy holding the red flag to warn the riders of dangers in the road. He was getting far too close to the riders and some sort of contact wouldn’t have been surprising. The biggest danger on this stage is likely to be a bloke holding a red flag. Agreed. This red flag s__t’s got to go. Put up some warning signs along the course if you must, but I fear this motorized red flagging will morph into some sort of “safety car” anytime someone gets their chamois-in-a-bunch. Have you ever ridden a race? Those guys don’t only hold a red flag as a visual reminder but also blow whistles as an accoustic warning. And they are quite loud. Much butter than any warning sign. Yep, agreed. When they’re good, they’re great. But this guy seems to be travelling a little too close to the front of the peloton, which I’d find a bit disconcerting. So they are unlikely to disappeared in the very near future; if ever. As has been noted, great to see Gilbert celebrate his win sans sunglasses. That’s one in the eye for the sponsor! “Hesjedal resembles a wounded giraffe trying to gallop.” – Chateau, Mr Inrng! Typo: Villella (double double “L”). I’ve got to check it out every time, anyway. As many have noted, just great about Hesjedal’s wounded giraffe style. “Wounded Giraffe” is a good one! What would it be in Italian? “Giraffa ferita”? To me Froome resembles that cartoon skeleton who plays his rib cage like a xylophone…that tune runs through my head every time I see him ride uphill fast. That would be the literal translation, “una giraffa ferita che prova a galoppare”, but I think that in Italian it would be clearer if you said “una giraffa azzoppata che prova a galoppare”. It’s definitely better in English, anyway. I would fancy an all-out deploy by Movistar in full today. They have much to fight for, blue jersey for Beñat Intxausti, 3rd spot for Amador, remarkable stage win, and they have men to do so. It’s great to see Cannondale getting some visibility this Giro after months of nothing. Hopefully this gives the team a (figurative) shot in the arm to push on later in the year. Trying to shade the tan marks, I’m afraid. Question, what is the meaning of the numbers(and scale) on the right sleeve of the maglia rosa? Indeed cyclist look more friendly without the bug like sunglasses, amazing that even in interviews after the race some keep their glasses on. Fairly likely to be Paul Smith’s very self-conscious reference to fashion, especially Haute couture. Looks like the rule measure dress makers use. See the product description here. It is a reference to a tape measure. Though I was wrong about the designer responsible. Paul Smith did the design last year. It is by Lebole this year. Just an historical point: the Valle d Aosta was never french. Before 1860 it was part of the duchy of savoy which also included the now French departments of Savoie and haute Savoie along with the city of nice. These became part of France after Italian unification whilst Aosta went into Italy although at that time still mainly french speaking. Its currently officially bi lingual and a semi autonomous province. And they belonged to the Italian reigning family (speaking of monarchs), who in fact were the Savoia family. They gave them out in some diplomatic deal to favour unification. Garibaldi wasn’t very happy about that, since he was from Nice. A long stage is so often not the most interesting one. Especially if all the climbs are towards the end. Have some near the start and a GC guy might just attack, however unlikely. Aru gifted a stage and 2nd place overall (thus far): Landa must be livid that Contador chose to save his energy. How many more times can the director(s) on this Giro cut away from a crucial/interesting moment? Second last climb, battle for mountain points is on, director switches back to the peloton for a while (nothing happening) and then shows us Kochetkov in second place on the road who is not racing for anything. We miss Inxausti winning the battle. They clearly need people in charge who actually know something about bike racing. Also, don’t always cut to adverts on the downhills – sometimes they’re more interesting. I agree on the directing. Terrible. I wonder whether Bertie was either savig himself for tomorrow to make sure of a stage victory as the Giro leader, or whether he’s started his ‘active recovery’ for the tour. It’s as though he worked very hard in the second week to enable him to wind it down a little early in the last. Wow. Either those riders are terrified by TV cameras or the atmosphere in that team is horrendous. One can’t help thinking that Oleg’s presence is the problem. I bet Contador regrets that Riis’s removal came after his re-signing for next year – and I’m sure he realises that that timing wasn’t coincidental. And I bet a lot of those guys are desperate to get out of that team (and he’s already said he wants them out – which must really help team morale). Who would want to work for MegaOLEVomaniac? He should have his own TV show like the screwball Donald Trump! Rumors were going round about “Mr. 60%” starting a new team and taking Pistolero among others. I’m sure he’s not the only one who’d like to get the hell out of there. Sagan can’t be too happy there either? Yeah, I saw the rabbit ears, and thought ‘what a bell-end’. Here’s this guy, trying to do his job & explain stuff to the riders (albeit in the MOST boring possible way), and this monkey is doing rabbit ears. Basso, Rogers, Paulinho et al must be thinking ‘what is this circus’. Good to see Sean Kelly stick the boots in when asked about it. No fence sitting there!